Team B selected via this mode (TSC or SM/ISC as the case maybe) will be representing WSC only or both WSC & WPC. Or there is Team B only for WSC and no Team B for WPC. Its pretty clear that Team A for WSC/WPC will be selected through this offline events, i.e., Top 4 contestants of ISC/IPC. But, how the Team B for WSC/WPC will be selected?? Just like the previous year, Team B will comprise people who finish in the top 4 of TIMES sudoku Championship(provided TSC happens).If there is a overlap of contestants between the finalists of TSC and SM , then people further down the ranks in SM finals will fill the remaining spots. ETA : The top inexperienced contestant from ISKL would also be sent an invite for B Team . Check under the prizes header in the following link . Continuing the process as detailed here, ranks 31-60 of both SM & PR have now been sent an email. The participants at ranks 1-30 who did not confirm their participation either way have also been sent this email, as a reminder. Please read carefully and let us know about your attendance and payment preference. Location: India Hi, Can you tell how the schedule will look like on 29th? like what time the event will begin and end? will help in planning the travel. Hi, Can you tell how the schedule will look like on 29th? like what time the event will begin and end? will help in planning the travel. Hi. It will generally be a day-long event from 9 am to 6 pm including Registration, Prize Distribution etc. Location: India Would we have a sample booklet for the offline finals on Jun 29th? Location: India When is the IB for ISC/SM finals expected?? Location: India All the best to everyone for the National Finals. For everyone's reference, below is the Google Maps link for the event venue. Location: india That was a fun filled 2 days of sudokuing and puzzling at the Indian Sudoku and Puzzle Championships(ISC&IPC).Thanks to all authors for creating a set of absolutely brilliant , splendid and world class sudokus and puzzles and to organizers for running the event beautifully.I enjoyed a lot ! I am sharing the link here to the photos and a few videos taken at the event .If some of you have anymore please share it here. Location: India Thanks for the photos Rakesh. Location: India I will be putting up a full report page soon, but for now, here are the official results. Location: India ISC 2017 along with the SM finals was an amazing experience. The whole bunch of Sudokus that appeared in Round1 to Round4 of ISC and then in Classic Sudoku Master were nicely crafted. 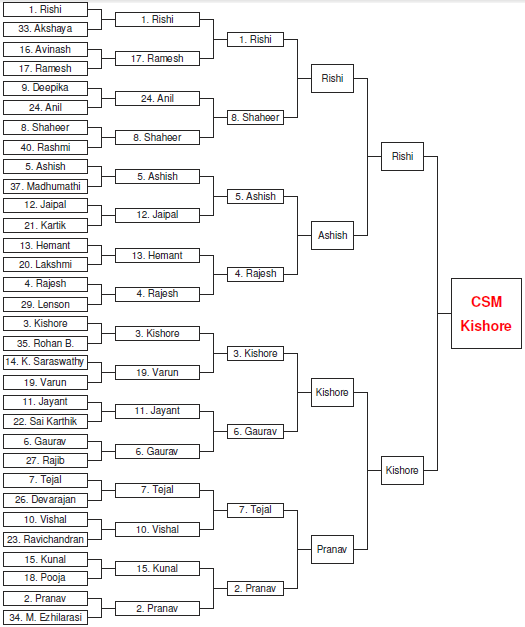 Inspite of my poor performances in rounds 3 & 4, I feel the grids really tested solver's skill in all aspects. I enjoyed being part of the event especially the classic sudoku master event. Thanks to authors and organizers for offereing us such a wonderful event. Location: India it was my first time in ISC and i thoroughly enjoyed solving each and every sudoku and the event. it was a very nice experience....looking forward to be a part of many more events in future. Location: India Congrats and all the best to the selected Teams for the WSC and the Sudoku Mahabharat playoffs winners. It was a wonderful weekend for the Sudoku and Puzzle enthusiasts across the country. The Sudokus across the four rounds were of high quality and challenging in general. Thanks to Prasanna and LMI for organization of the event and collaborating with different authors across the world for the National championships. I really enjoyed the event even though my performance was below par in the rounds especially a disastrous fourth round. The recreational event Classic Sudoku Mahabharat has an encouraging format with everyone taking part. This can be improved by involving the audience in some format like handing over some of the puzzle sheets till the Quarter finals so that this may keep them engaged. As suggested earlier, we can rework on the schedule. Thanks to LMI for finalizing Chennai as the venue for the second successive year and this gives us confidence to organize more events in the city. Thanks to all participants who came to Chennai all the way from different parts of the country and made the event successful. We hope you had a great time here. Do share your feedback on the event, suggestions for improvements for our introspection of the event and these suggestions will be points to be noted for future hosts as well.